The National Football League (NFL) may have more than a passing controversy on its hands as it continues to grapple with fans’ reaction to the players and staff “take a knee” protest during the national anthem before games. But looking directly at results for each question on the survey also reveals that a majority of respondents said would watch less football and that they support President Donald Trump’s decision to speak out against the protests. The raw data shows that when asked, “What has changed about your relationship with the NFL?” 80 percent said they will watch less football on TV because of the controversy and more than 53 percent said they are more supportive of Trump since his remarks last month that the protests are disrespectful to the U.S., its flag and the men and women in the military and law enforcement who sacrifice to protect all Americans. 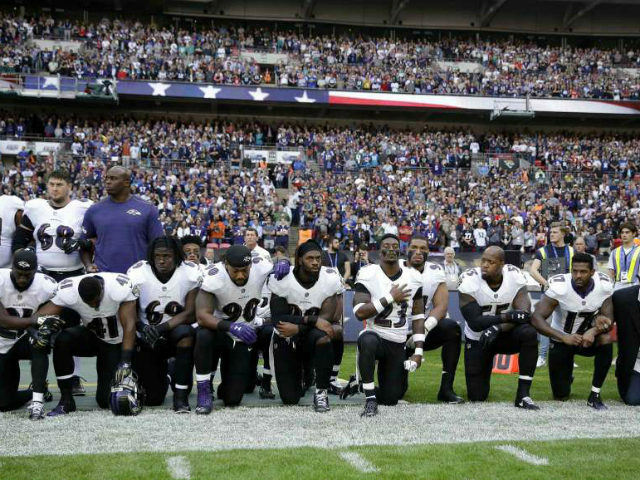 In fact, 77 percent said they believe it is wrong for players to kneel during the national anthem — a protest begun in 2016 by a former NFL player who claimed he kneeled because of social injustice in the U.S.
“Those findings all have financial implications for the NFL and its 32 team owners,” Yahoo Finance reported.